Nier: Automata sold way better than anybody expected a quasi-sequel to a spin-off of a 14-year old, niche RPG series to sell. 2 million copies, actually. The numbers far exceeded what Square Enix had in mind for the quirky RPG, and the publisher is confident enough to move forward with another entry - pretty quickly too, by the sound of it. According to an interview with Japanese magazine Dengeki PlayStation (translation via Gematsu), Nier: Automata producer Yosuke Saito says that "Well, as for a game, we’re making preparations for the setting which you could guess from the fact that we were recruiting a scenario planner." Square Enix posted the scenario designer position in September, which called for someone to help build the world, NPCs, and quests players would expect to see in a Nier product. Saito says that creative director Yoko Taro (you know, the eclectic game designer who likes to wear masks or use sock puppets during interviews) will be involved. Probably. "He is [involved]... I would like to believe," Saito said, laughing. "Yoko says he will do anything as long as he receives money for it, but there is no one who doesn’t move for money as much as that man. He only wants to do what he wants to do." 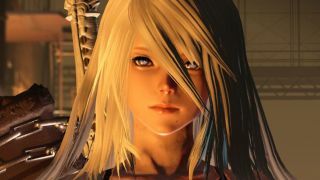 Saito did not say if PlatinumGames, which developed Automata but not the original Nier, would be chosen to handle development. It was seven years between the release of the original Nier and Nier: Automata, but it sounds like this new project (be it sequel, prequel, spin-off, or something else) will be coming much sooner. That's fine by me - I went from mild curiosity about Nier: Automata to counting it among my top 10 games of all time, and I found its exploration of heavy themes incredibly touching. If you haven't played it yet, you should get on that.